Question 1 through 3 refer to the following email. How are you? Mom, Dad, and I miss you. Did I tell you about my new hobby? Well, I was looking for some kind of treatment for my backache. I was waiting for the bus a few weeks ago, and I told the woman behind me in the line about my back problem. She was a yoga teacher, and she said that if I do yoga, it might help. It’s too easy to know if it’s true or not, but I am taking classes with her twice a week. The classes are on Tuesdays and Thursdays. Because of my yoga classes, I cannot call you next Tuesday. Is Wednesday OK for you? Please let me know. 1. What do you think the relationship is between Stacey and Sharon? 2. Why did Sharon start yoga? D.	She doesn’t study yoga. 3. What will Sharon do next Wednesday? A. She will study yoga. B. She will call Stacey. C.	She will go shopping. D.	She will miss her mom and dad. Question 4 through 7 refer to the following memo. Swifts Motors is proud to be official sponsor of the Country Squire Grand Prix in Flagstaff Arizona on Friday, April 1, 2005. This is our tenth year as the official sponsor. We know that this grand event is eagerly awaited be everyone here at Swifts Motors. As an employee of Swifts Motors, you will receive a 30% discount on general admission to the big race in Flagstaff. Because we value employees and their families, you will also be given free vouchers for the hospitality tent where you can enjoy a buffet and drinks during the race (limited to 4 vouchers per family). The buffet normally costs $15 per person ($7.50 for children under 12 years of age), so this is a great deal. Families will also get a garage pass giving full access to the garage where they can see the mechanics in action. Unfortunately, because of the potentially dangerous nature of the garage, only children over ten years of age can be admitted to the garage area. We are sorry to disappoint the young ones, but we do have to consider safety. No doubt you will understand our reasons. There are only 150 seats available in the stands, so make your reservation now. Don’t miss out on the event of the year! 4. Where is the buffet located? 5. How is this announcement for? 6. What is NOT offered in the announcement? 7. Who cannot enter the mechanics garage? Question 8 through 11 refer to the following sign. – You are required to carry your library card to enter and to use the library. – This card must be used only by the member to whom it is issued. – The use of cell phones in the library is prohibited. If you fail to observe this requirement you may be asked to leave the library. – Smoking í not allowed anywhere on the library premises. Please extinguish all cigarettes before entering, and go outside if you wish to smoke. – Books must be returned when requested if other patrons need them, or a fine must be paid. – A fine of 20 cents per day is payable on books returned late. There is no maximum limit on late fines. – If a library user loses a book, he or she must pay the costs of a new hardback edition. 8. Who would need to read this sign? 9. How may use a member’s library card? 10. What rule does the library have regarding people’s bags inside the library? A. All bags must be left at the desk. B. Bags are not allowed. C.	Only small bags are allowed. D.	People must watch their own bags. 11. What maximum fee for someone who returns their books late? B. There is no fee. C.	There is no maximum fee. Question 12 through 16 refer to the following letter and sign. 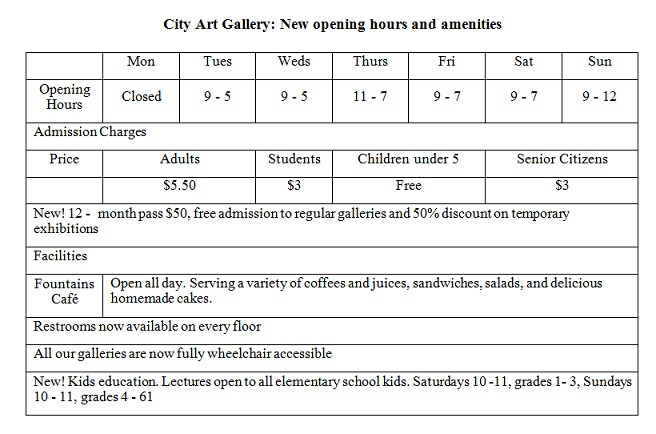 We are pleased to announce the grand reopening of the City Art Gallery. The gallery had been getting very dirty and run down, so we decided to renovate it and give the city an art gallery that looks as good as new. We know that all members have missed their cultural visits over past 6 months. An opening ceremony will be help on March 22nd, and general admission will begin March 23rd. as one of our members, you are entitled to attend the opening ceremony and get a sneak preview of our renovations and improvements. If you take a look at the enclosed information, you will see the changes that have been made. I’m sure you will agree that we have greatly improved the facilities. As a member, you will be particularly interested to note that we have decreased the cost of the 12 month pass. We look forward to welcoming you to the opening ceremony. 12. Why was the City Art Gallery closed? A. There was a fire. B. It closed at 5 p.m.
C.	It had no visitors. D.	It was being renovated. 13. Which of the following changes is NOT mentioned? 14. When is the gallery NOT open? 15. Who can attend the lectures on Sunday mornings? D.	There are no lectures. 16. What can be found on every floor?